I came up with the idea to be a paper doll for Halloween through the power of Google. 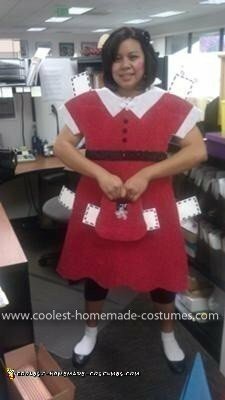 I was actually researching for best costumes for 2011. 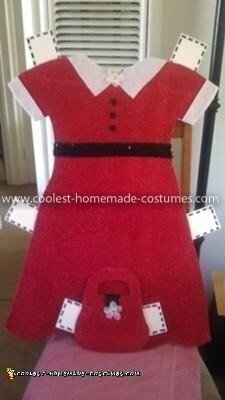 I was directed to the Disney’s Family Fun website where they had an idea for a paper doll costume for kids. So I said ‘I can do that’. But then I took it up a notch and went back to Google to research paper doll costumes, and what do you know, there was the link for the coolest paper doll costume. I became inspired by the ONE and ONLY submission (Thanks Haley from IN). So I started with cardboard. I actually took a couple of FED-EX boxes (part#139752) from work, it was the perfect size for the dress. I took out a dress of mine, just a plain below the knee size cotton dress and laid it on top of the cardboard. I used a pencil to trace around the shape of the dress, and eyeballed the sleeves to the way I wanted them. Again use a pencil so you can redo the outline to your specifications. I then used a black marker to trace over my pencil so that I could see it better before I started cutting. I used a box cutter to cut out my dress. I was amazed at how simple it was (actually, I had to do it twice since one arm came out shorter and skinnier than the other, LOL! Good thing I grabbed that extra FED-EX box). For supplies to decorate my dress, I used a glitter red wrapping paper (I imagine you can use any print) that I had found by chance at a yard sale the day before, for only .50 cents! From there, I decided I’d use white felt for the collar of the dress and the sleeve cuffs. I then bought some simple black buttons and about a yard of the black stretch sequins. I had some extra flowers from my handy craft box at home (which I found at my local craft store). Putting it all together was easy. I used spray adhesive to stick my red glitter wrapping paper to the card board. Once I had it on, I just used a scissors and an exacto knife to cut out around the shape of the cardboard, and to clean it up. For the collar and white cuff sleeves, I cut about four 2×4 strips of white felt, and hot glued them into place. I then hot glued the buttons and flower. Last step was to make the paper doll cut out tabs. I used white construction paper and cut out six 2×4 strips. I used a black sharpie to make cut marks all around each strip. I used regular glue to fasten 4 of those on to the dress. The hardest part was figuring out how am I going to strap this on? Well, I took the advice from the submission posted and cut 4 strips of one inch wide ribbon (about 12in long each) and placed 2 strips near the top (about 3 inches down from the top) and 2 strips near the side (about 3 inches inward) so then after I hot glued and used packing tape to hold it down, it would tie on like a bikini top (NOTE: I tried to staple straps but it went right through the cardboard). And what do you know, I was done. I LOVED it! It was so PRETTY (my pictures may not show just how glittery it was). To go along with my dress, I made a purse. I found the template for the purse from Disney’s Family Fun site for the kid’s paper doll costume. I used the same material and process to make that as well. It was very quick and easy to do. I was lucky my daughter had a glitter bow headband that matched perfectly. I paired my dress with white socks and black flats. Behind it, I wore black leggings and white shirt to camouflage the white ribbon used to tie the dress to myself. Curled my hair and put on some pink lipstick for rosy cheeks. All in all, I got A LOT of compliments. Some people said it looked so good, they thought it was store bought and not homemade. It is a very original, unique and creative costume. NO ONE out there will ever have the same EXACT one, unless you make 2! And the best part, total cost about $5.